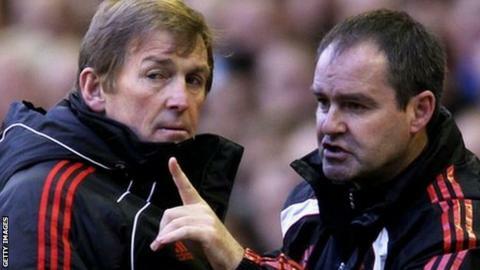 West Brom head coach Steve Clarke believes Liverpool are now starting to benefit from his and Kenny Dalglish's transfer policy at the club. The Baggies face a Reds side likely to contain Dalglish signings Jordan Henderson, Stewart Downing and Jose Enrique at Anfield on Monday night. "I'm not surprised the younger players that Kenny signed are starting to flourish," said Clarke. "It can take time for people to settle into a club the size of Liverpool." And he added: "Luis Suarez has really settled into the club now and, if you look at it at this stage, Liverpool are probably playing the best football in the Premier League." Clarke returns to Anfield for the first time since he and Dalglish were replaced by Brendan Rodgers last summer after 18 months in charge. Although Rodgers's reign has had its difficulties - the Reds were knocked out of the FA Cup by League One Oldham Athletic in January - they are in good league form, having collected points from successive 2-2 draws, at Arsenal and Manchester City. Clarke believes the first signs of Rodgers's influence are starting to show at Anfield. He said: "I don't think there's anybody in football now who thinks you just turn up at a club and create a good team just because they're a great, historical club. "You have to work at it. Every club in the league has to work hard to try to put a good team on the pitch and you have to work as hard as you can with your players. "Brendan went in there with a different philosophy to Kenny but Liverpool have always tried to play good football. Brendan has slightly different ideas that maybe took a little bit of time to get across. "But you can see now that the team is starting to gel and perhaps starting to play the way Brendan wants them to play."